Hollow seven-sided trapezoid carrying dial diagrams on five faces. The top surface carries a horizontal dial with circular scale (4 to 12 to 8) engraved around a central inset compass (needle missing) with magnetic declination mark for approximately 8 or 10? East. Between the compass and the hour scale which is divided to 30 minutes by alternating hatched and unhatched divisions, is a band of foliate decoration inhabited by birds. The corners are filled by cherubs' heads and wings. The east and west faces are engraved with polar dials for morning and afternoon (4 to 11 and 1 to 8). Along the top edge of the scale on the east side is a centrally placed crowned male head flanked by prancing horses and (at the extreme right) a bird. On the west side in the corresponding position a satyr blowing a horn is seated in a cart pushed by a second satyr, and preceded by a prancing horse. The lower corner of each side contains a seated human figure holding a frond. The south face is engraved with a circular vertical dial, the centre of which is filled with a scene of a winged cherub sleeping in a field with a rectangular diptych dial placed behind on top of a sand-glass, and with a sun-emblem placed above. 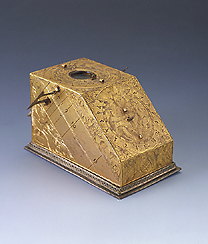 The reclining north face of the instrument also carries a circular dial (gnomon missing) the centre being engraved with two seated figures clasping hands above a pillar. This scene is virtually identical with that on face Ib of a compendium (Epact 85759) in the Florence collection. The corners are filled by a plant with symmetrically disposed leaves. The low front face is decorated with two cherubs flanking a globe. All the gnomons may be folded down when not in use being steadied in position by depressible studs controlled by straight brass springs on the inner wall of the instrument. There is a detachable silvered base with decorative cornice. This instrument should be compared with Epact 85759. Not only do they share a general similarity of style in the use of figural decoration to fill angles and corners of the instrument, as well as formal and flowing leaf decoration, but the scene of two seated figures clasping hands is, as noted above, virtually identical on the two instruments for pose and treatment, although there are slight variations in facial expression. The numeral punches used on these two faces also appear to be the same. They are fractionally over 2 mm in height and the distinctive 5 composed almost of two arcs, the 2 with an exaggerated bottom right descending serif and the I with unequal serifs to left and right at both ends of the vertical member are all present on both instruments. It seems therefore not unjustifiable to ascribe the two instruments to the same workshop. If this be the case then the polyhedral dial may have been acquired at the same time as the compendium and figured in the Grand-Ducal collections.